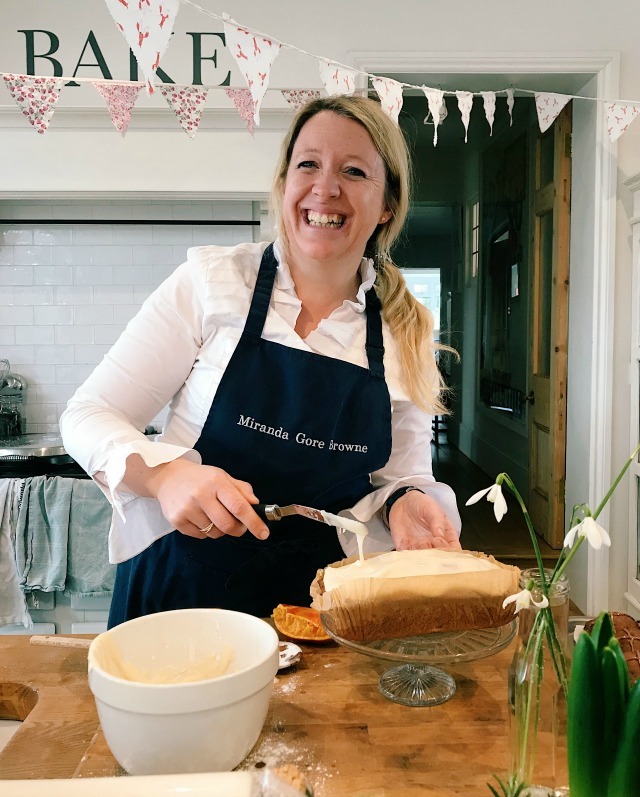 A couple of weeks ago I had the pleasure of meeting the very lovely Miranda Gore Browne at the Bookings For You Tuscan culinary masterclass I took part in. Miranda was a finalist in the very first series of the Great British Bake Off, and named 'the iced biscuit queen' by Mary Berry herself. 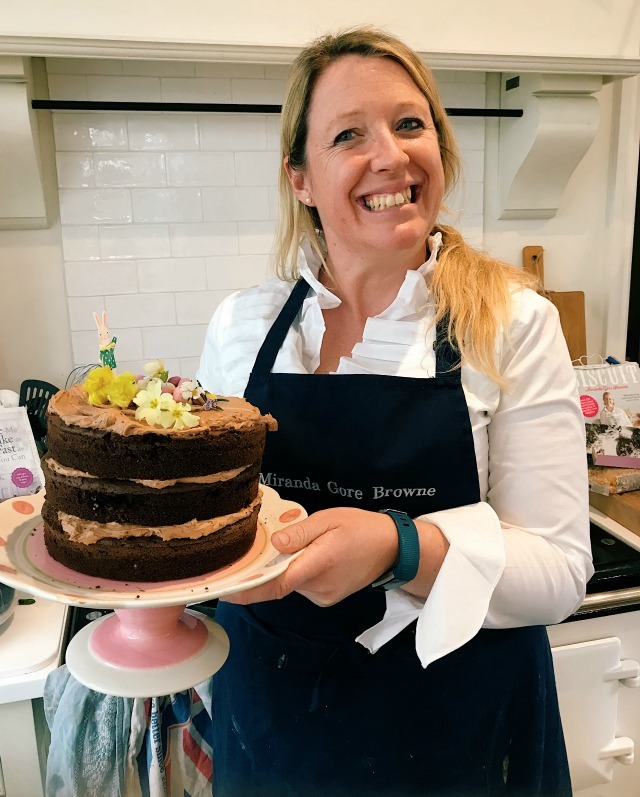 Since the show she has gone on to write two cookery books; Biscuit and Bake Me A Cake As Fast As You Can, and also runs cookery and baking classes from The Kitchen School, which is just down the road from me in Sussex. 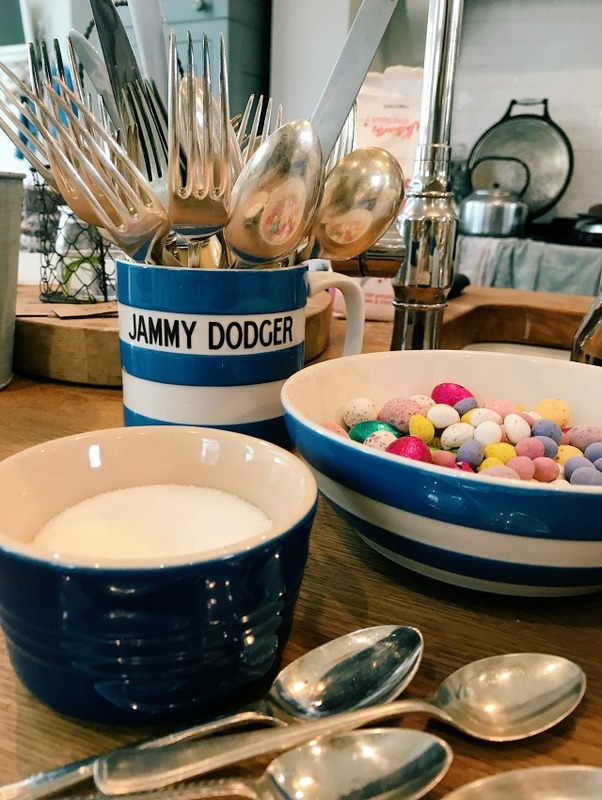 Last week she invited me to join her at her Spring cookery and baking class and I had an absolutely wonderful morning learning some new, seasonal recipes and admiring her Cornishware collection! 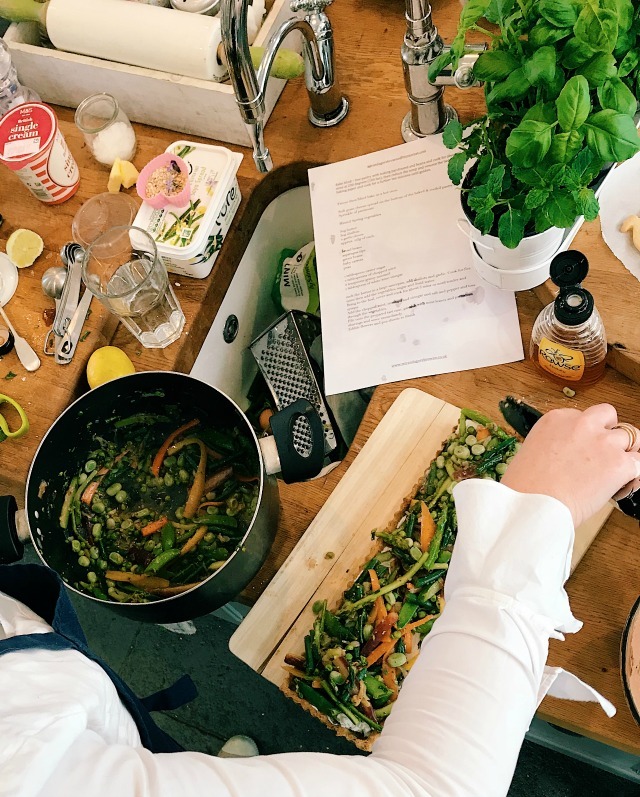 The aim of the session was for everyone to leave feeling inspired and confident enough to be able to recreate all the recipes covered back home, and the class came just in time for Mother's Day and Easter! When we first arrived, we were greeted with steaming hot cups of coffee and cinnamon and honey chocolate buns and after a few friendly introductions, it was time to get cooking! One of the light meals we learned to create was a super simple, and very virtuous, pea and lettuce soup. 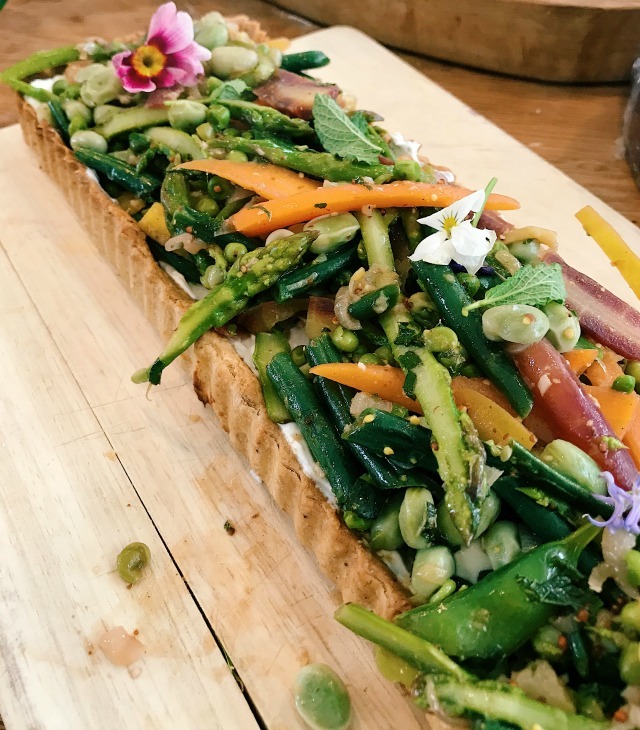 This was my favourite dish of the class; I loved that it took no time at all to make and that the ingredients were all ones that you're likely to have indoors at any given time! Fry the spring onions in the olive oil until softened. Add the peas and the lemon zest. Add the lettuce and wilt. Pour over the stock and add the sugar, then bring to the boil. Allow to simmer (uncovered) for ten minutes. Add salt and pepper, and the basil and the mint, and blitz with a handheld blender / nutribullet. 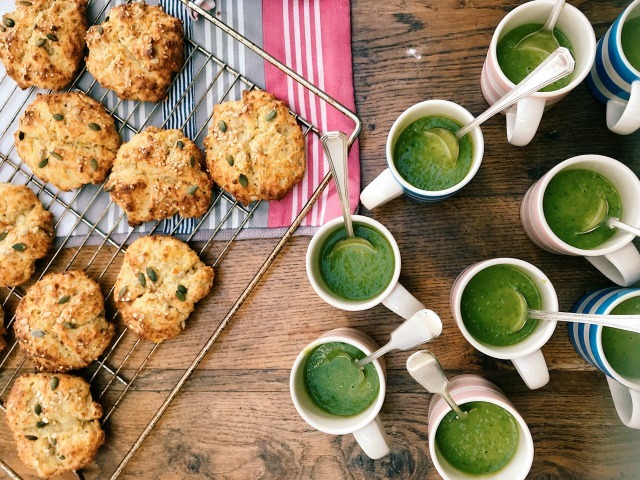 Serve with a hunk of warm bread - or with little apple and cheese oat breads (pictured). .... and how to make simple iced biscuits and a chocolate Easter cake. 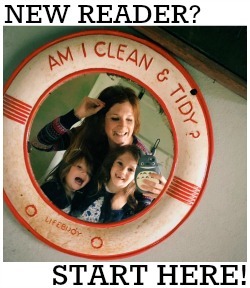 The tips I came away with were absolutely brilliant so I thought I'd share them with you in this post. There are quite a few but I wanted to include them all because, quite frankly, some of them blew my mind! When it comes to baking, stick to what you know. Master a basic recipe, then adapt it to suit the season, or the taste of whoever is going to eat it! Coarsely grate cold butter when a recipe calls for it to be rubbed in, eg in biscuits or a crumble. It makes the job so much easier! Double batch whenever you bake - cakes and biscuits can be frozen and wrapped in parchment and foil or on their trays then covered with clingfilm. Once biscuit dough has frozen you can remove them from their trays and bag them up to save space in the freezer. ALWAYS defrost at room temperature (this will take around eight hours so overnight is ideal) and then heat in a low oven, at around 120 for half an hour, before you tuck in. Try to avoid rolling biscuits (and pastry) on wooden work surfaces. Wood absorbs moisture. Rolling onto paper stops it drying out and, in the case of pastry, makes it easier to transfer to the pastry dish. ALWAYS pre-heat the oven when baking, otherwise cakes and biscuits will lose lift and melt before they start to cook. When making hanging biscuit decorations, make the hole when the biscuits are fresh out of the oven - not when they're uncooked (the dough will spread and the hole may close) or have cooled down (they may crack). Always use vacuum packed yeast when bread making as it's the freshest, plus it comes in smaller portions so is less wasteful. Mix your dough in a glass / plastic / stainless steel bowl if you can. Old fashioned ceramic bowls are thick and cool and the dough can take longer to rise in the cooler conditions. The dough is ready to prove when it has cleaned the bowl. It shouldn't be sticky. Prove at room temperature and only move to the fridge if you want to slow the process down, eg if you're going out. Don't wrap with a tea towel when leaving to prove - use clingfilm instead (especially when baking with kids) as you can see what's going on in the bowl without having to remove the cover. Each time you lift a tea towel off, the temperature drops a little and proving will take longer. 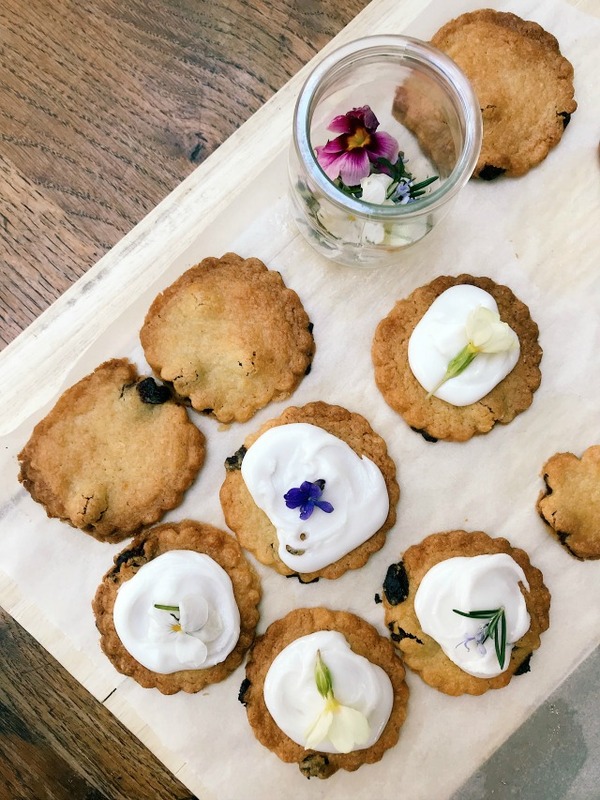 One of the loveliest ways to decorate recipes, especially during springtime - and this goes for biscuits, cakes and flans and tarts - is to use edible flowers. Edible flowers include daisies (yes really! ), primroses, violets, marigolds and all fruit blossoms. You can also use herbs like rosemary and mint. In sweet recipes you can sugar them to make them last longer (brush on whisked egg whites then dust with caster sugar). Thanks so much to Miranda for inviting me to a brilliant cookery demonstration! If you are keen to attend one yourself, she has classes running throughout the year which you can book online here. Miranda's books are also available on Amazon here and here.